Bijapur in the Deccan plateau of south-western India was the capital of a Muslim kingdom, founded by the Yadava dynasty in the 12th century. It fell under the jurisdiction of the Bahmani Muslims in the 14th century. Its era of independent magnificence was from 1489 to 1686 when the Adil Shahi sultans made it their capital and were in charge for Islamic architecture of exceptional quality. In 1686, the Mogul emperor Aurangzeb defeated Bijapur, but was powerless to exercise firm control and the region soon fell under Maratha sway, from which it elapsed into East India Company hands in the early 19th century. 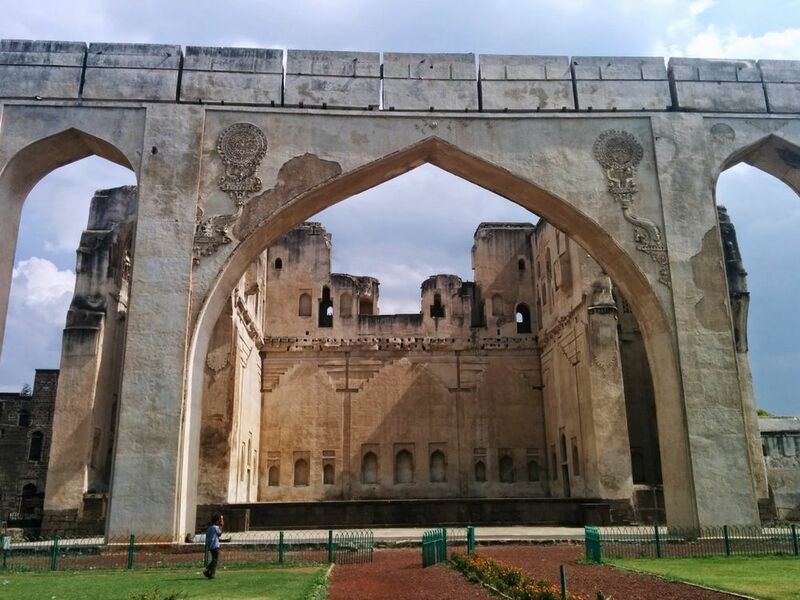 Ali Adil Shah I ascended the throne and aligned his forces with other Muslim kings of Golconda, Ahmednagar and Bidar, and jointly, they brought down the Vijayanagara empire. With the loot gained, he instigated ambitious projects. He built the Gagan Mahal, the Ibrahim Rauza (his own tomb), Chand Bawdi (a large well), and the Jami Masjid. The Shah was supreme power but in real practice, the Jagirdars, who acted as his counsellors or advisers, regulated his sovereignty. If the ruler possessed personality and keen intelligence, he could maneuver the chiefs by playing off one against the other, but if he was a minor, or did not fully devote himself to the affairs of the state, they dominated him. With the growth of the territories of the state after 1565 and the resultant increase in the Shah’s prestige and powers, he began to conduct the business of the state with the help of ministers who were placed in charge of various departments of the administration. These ministers held office during his pleasure only. However, whenever the Shah’s authority was weak, they assumed larger importance. Gagan Mahal, so called because of its tallness almost touching the sky, was built during the Adil Shahi Sultan Ali Adil Shah I who ruled from 1550 AD., to 1580 AD. In keeping with his victories and wealth that he amassed, he planned to make his capital Bijapur a beautiful and imposing city with many elegant buildings. Gagan Mahal is one such building. Gagan Mahal was built in 1561 AD., at the order of the Sultan Ali Adil Shah as his palace as also for his durbar. Thus, it served the two fold purposes of Sultani residence and royal court hall. The greatness of the building lies in the fact that it is a congruent combination of both these purposes. The private residential area was on the first floor just above the royal assembly hall. Two massive wooden pillars supported its wooden floor. It had wooden projecting balconies from where the family members of the Sultan, particularly the ladies could watch the spectacle in front, be it royal assembly or sports or any other royal event, including watching the Sultan seated on the throne. Staircases were provided on the back wall for going up or coming down. The staircases also led the inmates to the living rooms, bathrooms, kitchen, and other parts of the residence without being watched by outsiders. Thus, it provided safety, refuge, and privacy to the royal family. The description of a city in Persian language is one of its fascinating characteristics. For poets and writers, the subject matter gives the occasion to admix poetic imagination with historical realities as well as the actual existing features of the buildings, such as, gardens and water bodies. A beautiful description of Devgiri or Daulatabad in the works of Amir Khusrau is illustrative of the point. There are plentiful descriptions of the beautiful city of Hyderabad, Bijapur, and Aurangabad in the south, Kashmir, Lahore, Kangra, Delhi, Agra, Jaipur, Lucknow, Narnol, Hissar and others in the north. Notwithstanding the abundance of material on cities in Persian literature in various libraries and museums, neither the works are well known nor were they used to reconstruct the cityscape. 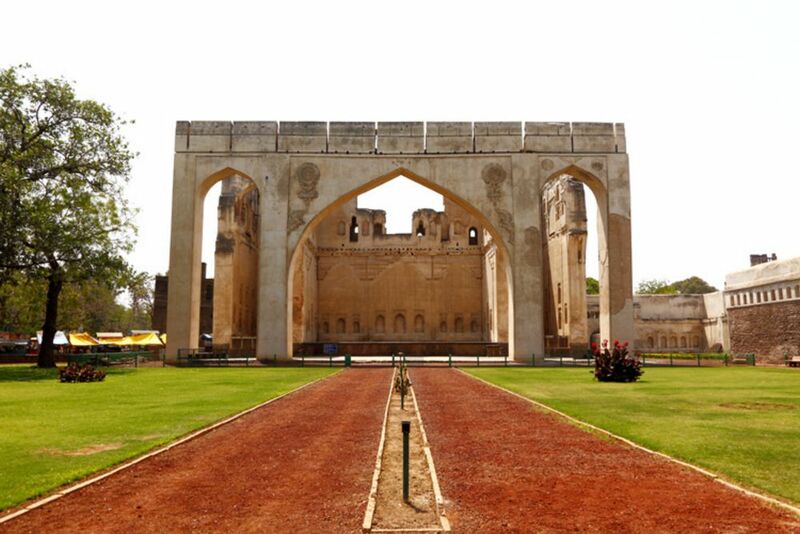 The beauty and majesty of the Gagan Mahal structure is the vast central arch, which has a span of over sixty feet. On its both sides were two smaller spanned arches thus giving a rare spectacle of three arches in a row of superhuman magnitudes. This was indispensable because it faced the Durbar hall and the Sultan and his ministers had to have full view of the happenings in front such as sports, wrestling, music etc. 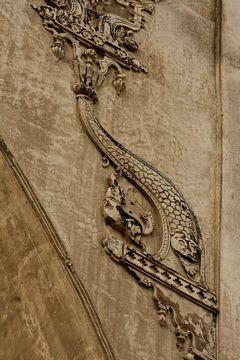 Thus, it served a convenient purpose and added majesty to the building. There is a great deal of woodwork in Gagan Mahal. The complete ceiling of the main hall was of wood being supported by heavy beams, wooden window frames and projecting balconies and eaves and pillars. Most of them were painted and gilded to give a royal effect. This palace had its significant periods also. When Mughal emperor Aurangazeb defeated the last Adil Shahi ruler Sikandar, Aurangazeb sat on the throne at this palace and Sikandar was brought before Aurangazeb in silver chains as a captive. Regrettably, most of the Gagan Mahal is in ruins today except the three main majestic arches symbolizing the strength and glory of the Adil Shahis. Is Costco threatened by Amazon?